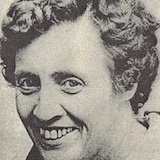 On Nov. 22, 1919, Maire Drumm (nee McAteer), Republican activist, was born in Newry, County Armagh. Maire’s family was strongly republican; her mother had been active in the War of Independence and the Civil War. When she moved to Dublin seeking employment in 1940, she joined Sinn Fein. Later, now living in Belfast, she became interested in camogie (the female form of hurling) and started a lifelong involvement with the sport in Ireland. Maire also became active in the republican movement in Belfast. While visiting republican prisoners there she met James Drumm whom she married in 1946. When the IRA renewed the armed struggle in the late 50’s, James was again interned without trial from ‘57 to ‘61. When the civil rights movement began in the late 60s Maire was actively involved in the efforts to rehouse the thousands of nationalists forced from the homes by Unionist intimidation. Maire began to speak at many rallies and protest meetings and was elected to the Ard-Chomhairle of Sinn Fein. With her activities now high profile, Maire’s family was targeted for government harassment. At one point her husband and son were interned by the government at the same time; James would become known as the most jailed republican in the six counties. Maire was also jailed twice for ‘seditious speeches,’ once along with her daughter. Following her assassination, the then President of Sinn Fein, Ruairi O Bradaigh, said: “She died as much to liberate those who murdered her as those who would have defended her had they been present”. “Firm and uncompromising in her public attitudes, she was in private the most warm, compassionate and hospitable of people, she had a genuine love of human kind. and especially of her own oppressed people, who in their turn, took her to their hearts long ago. “Now that Maire Drumm is dead, the uncharitable expressions of some public figures who lead closely guarded lives surrounded by maximum protection of the British Occupation Forces, ill becomes them and reminds the Irish people of similar sentiments expressed by them following the Bloody Sunday massacre in Derry. “Indeed, some of the comments by politicans and pressmen on both sides of the Irish Sea in the past have not helped and have assisted in making a political figure like Maire Drumm, the target for assassination squads. “The refusal of a visa to her to enter the United Slates is likewise difficult to interpret; one wonders what the American State Department, acting under British pressure, had to fear in exposing Americans to a realistic exposition of the facts of life under English rule in Ireland. “One aspect of Maire Drumm’s life is clear to all who worked with her; she ceaselessly advocated the rights of the Loyalist communities in the New Ireland, and consistently guarded and developed lines of contact with them. Those with whom she was in touch among the Loyalists knew well of her persistent work for a just peace in Ireland; it devolves on them to come forward and acknowledge this now that she is no longer there to survey one such vital work. “For her comrades, Maire Drumm is not dead, she lives, she inspires us - in every street barricade, at every prison gate, at every mass demonstration and confrontation, she is there, urging us on to even greater effort. Her tireless spirit beckons us forward in our struggle for the New Ireland, for the liberation of all mankind, tor freedom, justice and peace.